I knew the day was coming, I just didn’t expect it quite so soon. My eldest is 16 and has been playing soccer since he was 5. Mighty Mites at Vereinigung Erzgebirge — ah, those Friday nights watching tiny kids run around en mass, chasing each other more than the ball — beer in my hand. On to recreational soccer at Montgomery United — where honestly, as a six-year-old, not much changed — except I was beerless. Then, as an eight-year-old, it was on to travel (now known as competitive). We had a good run — I say we, because it was about this time that I took on uniforms and spiritwear for the club and my husband became the head coach for Paul’s team. When Paul got to middle school, he tried out for the school team and made it. It was his first taste of co-ed soccer. They were an awesome group of kids, and they remained friends for the next few years. As for club, at U14, he got called up to the A team. We told him going in to it that he would need to work hard to get a spot in the starting eleven. He rose to the challenge, worked hard, and became a consistent starter. For the next three years the team had its ups and downs, always one goal or game away from a trophy. Last year I wrote about how amazing that winning feeling is. I was so proud of Paul and his teammates for never giving up. I saw that again this past weekend in EPYSA state cups. Paul’s team at U17 was in a bracket with U18 teams. They fought to the finals, but lost in the 2nd OT. That was the third 120 minute game the team had played in 7 days – two in less than 24 hours. They never gave up. As a 9th grader, he made the high school team (9th grade is at the middle school in our district). I’m not sure who was more shocked — me or him! 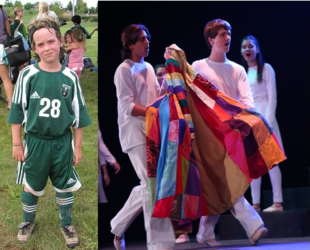 Also a surprise that 9th grade year, was my son turning to me on one of the many drives home from soccer practice, to tell me he was trying out for the middle school musical. Definitely one of the few moments I have been rendered speechless. When he puts his mind to something . . . and yes, he got a lead roll. This past winter, Paul tried out and made the cast of the high school musical. Two weeks into rehearsal, on one of the many drives home, he uttered the words no soccer mom wants to hear. My husband and I are sad. We have enjoyed watching him grow up on the pitch. Many tears shed (his out of frustration and anger — mine out of watching him be frustrated and angry) and many cheers yelled. Now I have half a season left to enjoy. And enjoy it I will. Every single game — before I transition to a stage mom. The best part is that he’s choosing to go out on his own terms. He’s not finished because he’s injured. He’s not finished because he’s not good enough. He’s not finished because nobody will give him a chance. He’s finished by his own volition, and that’s the best way to go out. The stage is a great place. It’s still weeks and weeks of practice with your team leading to the big important “games”. There are ups and downs and good moments and bad. I still perform fairly regularly. And when somebody says “break a leg!”, it’s a good thing! Agree with Adam. Also the experience of playing in a team and fighting to the end should be a lifetime lesson for him. Our eldest once said ‘I am done’ when he initially was thinking about going in College (he just wanted to experience College as a non-athlete). He ended up being recruited and had a great time playing in College and is now living in LA with 2 other College teammates. Funny how life goes. Maybe your boy will miss playing and end up coming back and playing for the H.S. Good luck to him! This is almost exactly my story. High school captain, traveling team, etc… and I left the game when I was 17 because of lack of a lack of passion and focused on music instead. I was better at those than I was at soccer, and they made me happy, broadened my world, and gave me access to experiences that soccer (at my skill level) never could have. The happy ending came when I started really missing the game in my 20s, met some friends who I could go to Fado with at 8am on a Sunday and watch Liverpool (I’m looking at you, Adam Cann), found a new club team to play on (and you, Mike Servedio), and figured out how to do all of that on my terms. My greatest soccer memories have happened AFTER my 30th birthday. So… all of that to say, who knows what the future holds for a clearly talented kid! Thanks for this article. Aren’t there yet but I can see the end in sight for my son (who won’t play beyond high school) and daughter (finding more passion in other sports). Best of luck to your son. He’s very lucky to have such an awesome stage mom. Thanks for sharing Staci! Haven’t reached the HS level yet, but getting there slowly. I’ve always said from the beginning that they play for themselves and their teammates, not their parents – no matter how much we love it. So long as they love the game and want to do it, I’ll happily pay the costs in time, energy and money. When they start thinking soccer/basketball is a chore for them, its time to invest that time/energy and money elsewhere – like new golf clubs and/or high end liquor! Staci, I feel your pain. My daughter played from 5 years old through her freshman year in college. Our family trudged through the most rural areas of PA and NJ to get to games and cheer her on. Sometimes multi game tournaments standing on the sideline in rain or snow. I’ve squinted at my computer while watching her college games on a crappy live feed. I’ve yelled, danced, cried and loved it all. She was always one of the smallest on the pitch and I’ve watched her grow from a timid little girl to a proud athlete who backed down from no one. During the summer after her freshman year, we had the talk. We were also in the car when she told me she thought that between practice and games she was missing out on too much of the college experience. I told her how I supported her decision and didn’t let her see how my heart was breaking a little. If it helps you, know that I took solace in the fact that she wasn’t quitting, she was growing, evolving. She graduated and moved half way across the country but still follows the Union with me. I look back on those years of playing fondly, from just running after the ball at 5 to learning the rules and strategies and all the blood, sweat, tears, and Dr visits that came later. I think soccer, along with a little help from me, helped mold and shape her into the confident, accomplished, forthright young woman she is today. I wouldn’t change our soccer experience for the world.